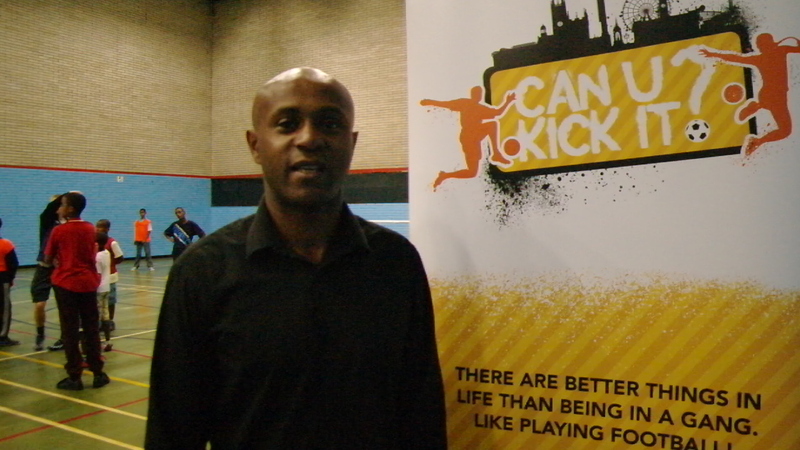 I was recently contact regarding a community football initiative called Can U Kick It? As a Dad and someone who believes in community football this initiative was particularly interesting. An initiative, which was started by Moss Side-based Fathers Against Violence (FAV), I would like to tell you a little about this initiative and its emotive roots. Can U Kick It? was launched by FAV, a grass-roots organisation which provides support for fathers in Moss Side and Hulme, training them to become mentors for young people who may not have a male role model at home. FAV was established by local resident James Gregory in 2011 to help families keep their children out of gangs. Mr Gregory felt a strong need to act after his son, Giuseppe, was shot dead in 2009 – the innocent victim of a mistaken revenge attack. Can U Kick It? offers free weekly football training to boys and girls ranging from the ages of 7 to 16. The sport-based programme is facilitated by volunteer coaches from the local community who also act as mentors to help build their confidence and broaden their aspirations. Can U Kick It? also offers participants a chance to develop key life skills including team work and social skills. “Gang violence has been a huge issue in Moss Side and Hulme for a long time, and has caused devastation in many families like mine. FAV and Can U Kick It?’s mission is to put to an end to the tragic loss of young lives by inspiring our youth to believe in themselves and have the ambition to pursue a life outside gangs,” said Mr Gregory. Can U Kick It? seeks to make a difference to the community by having a positive role model and through experiencing the camaraderie of a team which can change a young person’s perspective on life. I am sure you will agree that FAV is a truly worthy cause, and they are now looking to build upon initial support provided by HEINEKEN. As a Manchester based project, if you are running a business, know a business or would like to personally help Can U Kick It? including supporting resources to contribute towards the costs of a new training pitch, FA Level 1 coaching courses, first aid courses as well as team equipment then please get in touch and support this grassroots project. in the meantime, share this information on your blog or with you friends/followers to support raising awareness of this work.